Having a good credit score is one of the most important things to have in life. Your credit score will affect so many aspects of your daily and future financial life. Today I will talk about how to access your credit report and credit scores. I will teach you how to improve your score next time. While annual credit report doesn't give you your actual FICO score, it will give you a free copy of your report, which you are entitled to, once a year from each of the 3 major companies. You want to go to this site to see if there are any mistakes on your credit report. Up to 25% of all credit reports will have a mistake on them, which could affect your credit score for the worse. You can either request all 3 reports at once, or you can consider staggering them requesting one every 4 months. ps. do NOT go to freecreditreport.com, this is not the same as the link I posted earlier. This website is the official site to go to for your real credit score. They sell your official Transunion or Equifax scores for $19.95 each. Experian no longer sells your score anymore. You can either pay for your FICO score here, or you can get it for free after signing up their limited free trial program which will then charge you after 10 days of use. In the meanwhile, you can also get a very close approximation of your FICO score on the 3 sites I will list below. 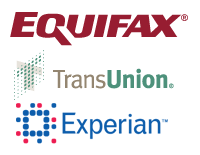 These companies do a "soft pull" inquiry of your credit report and generate a number based on some secret formula. Don't worry, going to these sites and updating your report / score will have no effect on your score. Going here will NOT lower your credit score! All 3 sites have different looks to them. The way these sites make money is that they try to use your credit score information to tell you which mortgage rates and credit card offers you may be eligible for. These sites also offer credit monitoring services, which it charges a fee for, and is totally unnecessary. This site provides your simulated Transunion score. You can update your score on a daily basis without impacting your credit. This website gives you your free credit report information such as all open accounts, and balances. This website also can give you an idea of what credit cards you may be eligible for based on your credit score. I check my score on this website every few days, just for fun. This site provies your simulated Experian score. You can get an updated report and score on a monthly basis. This site provides similar information as Credit Karma. Credit Sesame also has a sweet iPhone app to check your credit score on the go. This site provides your simulated Experian score and updates every 6 months. Quizzle has a nice interface that also provides you with some money management tools and budgeting tools. One tip with Quizzle, do NOT give them your real telephone number or they will call you constantly trying to get you to refinance your home! It's a headache and I ended up changing my telephone number in the account to get these phone calls to stop. In conclusion, do yourself a favor today by signing up for your credit scores and report. The whole process should take about 15-20 minutes, you can do it while watching TV and surfing the net. Enjoy.